In preparation for my first batch of home brew beer to be ready to drink I started off last night with another Belgian ale which will certainly be far better than mine. For starters it's brewed in Belgium. That gave it a leg up on any Belgian style ale I could cobble together. Secondly it was another beer in a series of gnome-themed beers. 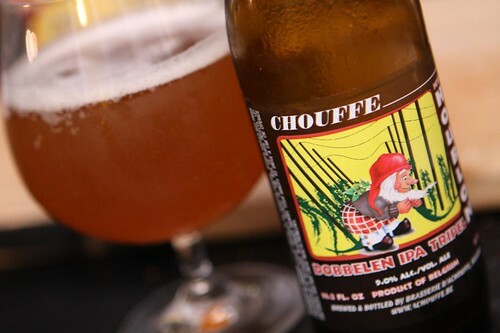 This beer was the Dobbelen IPA Tripel from La Chouffe, purveyors of fine gnome-themed beers. Their website is also features the second best flash animation of gnomes after Gnomesong!, the classic song and video from Lance & Eskimo. I got out of work late enough that I only had time to drive straight to the train to pick up Jen so I had to act fast. Luckily this dinner was made basically in the time it took to boil some water. 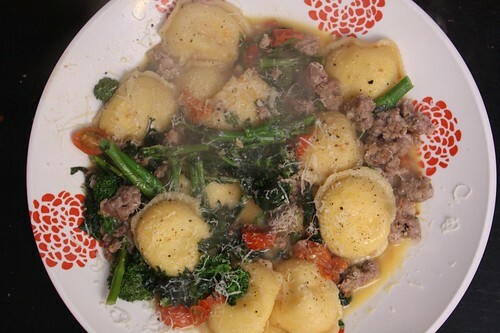 I browned a little garlic in olive oil and butter, threw in some sweet Italian sausage removed from the casing, added some blanched broccoli rabe, sliced grape tomatoes, a little turkey stock, and some cooked cheese raviolis. Over the top I grated some Reggiano-Parmigiano. Jen was very suspicious of doing this recipe with a ravioli instead of regular pasta. However, as she admits, she is often suspicious of just about anything I make. It turns out it was quite delicious and her fears were allayed -- just like they are every night. 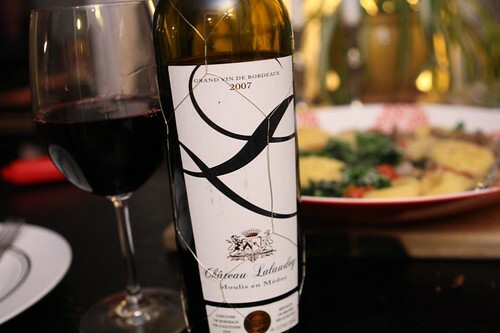 With dinner we enjoyed a bottle of wine we'd picked up in Bordeaux this summer. Well, not the exact bottle we picked up. That one was kindly disposed of by the terrible American section of the Zurich airport. Since there have been planes falling out of the sky left and right from wine bottle bombs it only made sense that they discarded this bottle which was hermetically sealed in plastic encasing marked, "Zurich Airport Duty Free." The wine was quite nice but it left a bitter taste in my mouth. I don't think it was so much the wine or the tannins but rather that taste of eroding personal freedom. It's better to be safe than sorry! Right, kids? I am 100% sure they drank your wine.